Scott's Web Log: Enviga in Hot Water? I live in New York City (technically, Queens, but its still part of the Big Apple and has twice Manhattan's population, but I digress). Since November 2006, we've been part of a test market for a new product called Enviga, from Beverage Partners Worldwide, which is a joint venture between Coca-Cola and Nestlé. Perhaps their best known product is Nestea bottled Iced Tea products. Its not everyday that we're a test market, thats usually reserved for places like Omaha or Des Moines. Apparently, because of the area's fascination with new products and its on-the-go culture, it was seen by marketers as a fertile test market for a new bottled beverage. So what is Enviga? Its a caffeinated, sparkling green tea drink (kind of a combination iced green tea/energy drink). They also have berry and peach flavored varieties. Apparently, Enviga will be hitting stores across the U.S. this week after being tested in NYC, New Jersey & Philly. Enviga is one in a growing class of so-called "functional foods," which are fortified with herbal supplements or other substances designed to produce a desired benefit in the body. Enviga's claim is that its supposed to help people burn anywhere from 60-100 additional calories, which is frankly no big deal. The only catch is you have to drink 3 a day. Oh, and the clinical trials were done on "healthy subjects in the lean-to-normal weight range," not on people who actually needed to lose weight. When I first saw Enviga at my corner deli on the way to the subway, I decided to try it because it was new. Unfortunately, it wasn't even labeled as being sugar free, but a quick peek at the nutrition facts label revealed that Enviga was sweetened with the chemical equivalents of a combination of NutraSweet and Splenda and therefore had few carbs from sugar or anything else. I guess it would be idiotic to sell what could be best described as a "weight loss assistance beverage" that is loaded with sugar calories, as that would negate any of the benefit the product supposedly provides. What does Enviga taste like? Well, it tasted like plain old green tea to me, the kind you can make yourself for next to nothing (if you want the added caffeine, just add a crushed No Doz , Stay Awake, or Vivarin tablet). Supposedly, the extra caffeine assists in the extra calorie-burning effect. Needless to say, I didn't find Enviga so envigorating, so I haven't bought any since. I'll stick with Diet Coke or Starbucks, thank you (actually, I prefer Tab, but only a few places still carry it). However, when Enviga hit the shelves (the label calls it "the calorie burner") I knew it was only a matter of time before someone challenged the product's positioning. Yesterday, Connecticut Attorney General Richard Blumenthal said that he had sent letters to Beverage Partners Worldwide, Coke and Nestlé seeking evidence to support the calorie-burning claims. He also said that he asked that the information be provided by next week. Apparently, Blumenthal wants evidence such as copies of scientific studies, clinical trials and tests to support the calorie-burning claims, along with information about any group that may have sponsored such studies. A Connecticut consumer protection law requires companies to provide reliable scientific evidence supporting diet product claims. If Enviga is found to be in violation of state law, the state can take action, such as forcing Coke and Nestlé to change their advertising, Blumenthal said. "Unless there are credible scientific studies to support these calorie-burning claims, they may be nothing more than voodoo nutrition," Blumenthal said. He did say "There's nothing per se illegal about the drink. It's the ads and the promotions - marketing ploys that may exploit false hopes, create false expectations and thereby be misleading or even deceptive." The Connecticut Attorney General is not alone in his concerns. The nonprofit food watchdog group, the Center for Science in the Public Interest (CSPI), says that Enviga burns money, and over the long term is more likely to result in a negative bank balance than negative calories. 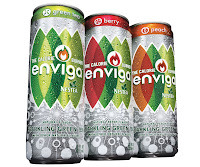 CSPI served notice on Coca-Cola and Nestlé, the companies behind Enviga, that it will sue them if they continue to market the drink with fraudulent calorie-burning and weight loss claims. Using the suggested retail price, someone drinking 3 Envigas a day would need to spend at least $116 a month. In its official statement in response to Mr. Blumenthal's investigation, Beverage Partners Worldwide said that a study conducted by Switzerland's University of Lausanne, in cooperation with the Nestlé Research Center, found that consuming the equivalent of three cans of Enviga in one day resulted in burning more calories. "We've seen a shift in consumers' attitudes toward diet and health and wellness, with more consumers seeking product choices that support active lifestyles, rather than dieting," said John Hackett, senior vice president, Coca-Cola North America Marketing. "Enviga is a great tasting beverage that invigorates your metabolism to gently burn calories, and it's a positive step people can take as part of a balanced lifestyle -- like taking the stairs." Nestlé researcher Dr. Hillary Green also said "The accumulated body of scientific research shows the ability of green tea's powerful antioxidant EGCG (epigallocatechin gallate) to speed up metabolism and increase energy use, especially when combined with caffeine." Studies have shown that when EGCG and caffeine are present at the levels comparable to that in three cans of Enviga, healthy subjects in the lean to normal weight range can experience an average increase in calorie burning by 60-100 calories. I think the claim that Coke's claim that Enviga "invigorates your metabolism to gently burn calories" was kind of stretching the truth. Think about it: there are about 100 calories in 2 slices of rye bread and another 100 calories in a hard-boiled egg, so you'd need to drink drink 6 Enviga's with your lunch to negate the calories in your egg sandwich (without any mayo). My guess is that you'd be so busy going to the restroom that wouldn't have time to eat anything else for lunch. Maybe that's the idea behind it. Oh, and by the way, the research only showed that Enviga increased calorie burning by an extra 60-100 calories, so you cannot simply drink away all the calories you might consume anyway. Also, the clinical trials were done on "healthy subjects in the lean-to-normal weight range," not on people who actually needed to lose weight. The bottom line is this: Enviga is an extra-caffeinated green tea. Its not a bad choice if you like green tea, and it doesn't taste too bad although I actually prefer regular iced tea. However, anyone expecting it to melt away their extra pounds (or kilos) is not living in reality. In the meantime, I'm sure the Connecticut Attorney General won't be the last one to investigate the product's claims. And remember this: the only way to loose weight is to use more calories than you consume. I've been drinking this at lunch for the caffeine and I have kept looking at the ingredients for sugar because I could swear I tasted some, but the splenda bit you said clears that up, its not actually sugar just tastes like it.